You no longer have to choose between giving up 50% of your profits or doing it all yourself. Whether you have a village or are flying solo, we make it easy for you to launch a successful fundraiser! You don’t need a huge committee or an army of volunteers. Follow our 3 simple to-do’s to get started. Discover how other schools, just like you, made the switch to something more meaningful and more profitable. At the end of your fundraiser, we’ll calculate the total net fees. 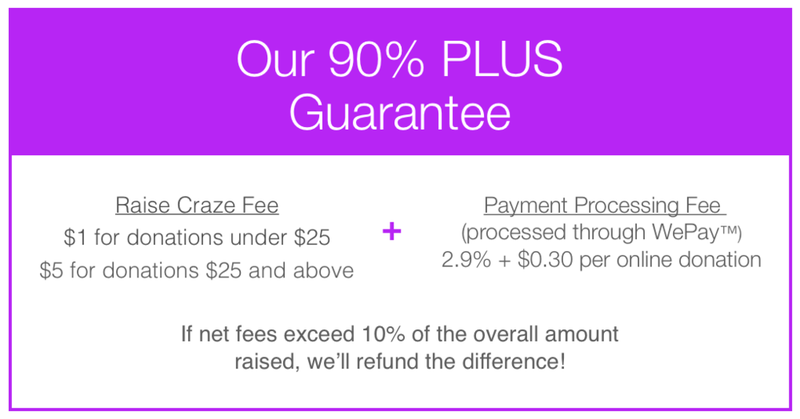 If the total net fees are greater than 10%, we’ll refund the difference! So what are net fees? Net fees are the sum of the Raise Craze fees and the WePay fees minus the fees that your donors cover through our “Keep the Kindness Going” Program.